Next month, hundreds of corporate representatives will sit down at their computers, log into something called Energynet, and bid, eBay style, for more than 300,000 acres of federal land spread across five Western states. They will pay as little as $2 per acre for control of parcels in southeastern Utah’s canyon country, Wyoming sage grouse territory and Native American ancestral homelands in New Mexico. Even as public land advocates scoff at the idea of broad transfers of federal land to states and private interests, this less-noticed conveyance continues unabated. It is a slightly less egregious version of the land transfers that state supremacists, Sagebrush Rebels and privatization advocates have pushed for since the 1970s. It’s called oil and gas leasing, conducted under the Mineral Leasing Act of 1920. With President Donald Trump touting in his State of the Union speech on Tuesday that Republicans have “ended the war on American energy,” you can expect leasing to ramp up in years to come. While title to the land is not transferred in these cases, the power of public oversight — which puts the “public” in public lands — is. Leased land remains under federal control, meaning that the companies operating there are subject to federal regulations and oversight, public access to the land is retained, and the American public still has a say over what happens there — but only theoretically. Oil drilling infrastructure surrounds the Pierre’s, an archaeological site on a road leading out of Chaco Canyon. The site itself is protected, but the BLM plans to lease thousands of acres nearby to oil and gas development this year. In practice, the public has very little voice in the leasing process or the permitting of development that follows. 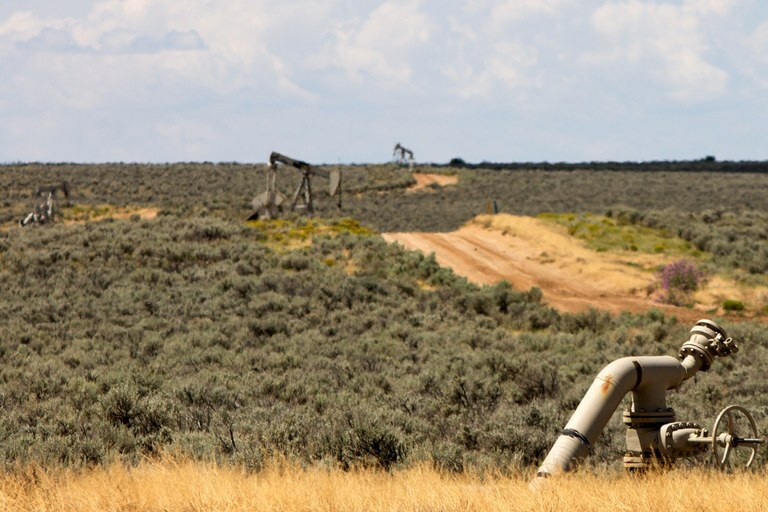 After an oil and gas company or the Bureau of Land Management nominates parcels for leasing, the public is given a chance to comment or file a formal protest. Quite often these protests fall on deaf ears. BLM data show that over the last 20 years, the number of parcels protested has no bearing on how many were removed from bidding. The Obama administration tried to give the public a bit more say on the front end of the process with its master leasing plans, but Interior Secretary Ryan Zinke killed the rule, and public impotence appears to be worsening. A High Country News analysis found that hundreds of protests were lodged against nearly all of the 1.4 million acres offered by the BLM for lease in six Western states in 2017. A vast majority of the protests were dismissed or denied. From 1988 to 2016, an average of 3.43 million acres — or 5,300 square miles — of federal land was leased out to oil and gas companies each year. The leases vest the companies with property rights to extract oil, gas or other resources from the land. Those rights are retained for the term of the lease — 10 years or more without development and indefinitely after production begins. If the land becomes a national monument or gains other protected status during the lease, the property rights remain in place. By the end of the 2016 fiscal year, private interests controlled more than 27 million acres of federal land through leasing. Before the leaseholder can scrape away a half-acre of vegetation and topsoil for a well pad and drill miles into the earth, it must get a drilling permit. While public input is typically not a part of the permitting process, the public has an indirect voice by way of the regulatory framework officials must work within when issuing the permit. This process represents the last vestige of public ownership over the leased land. Now Zinke is doing his best to blow that process to bits. The Interior secretary has weakened regulation of fracking, methane waste and other emissions and reopened a loophole that was closed under President Barack Obama to reduce royalty fraud on public lands. Now, he’s looking to axe older rules, too, many of which protect wild spaces and cultural resources from development. Under Zinke, industry will run over the public lands like they own the place, and land management agencies (public employees on public lands) will have little power to stop them. So, while Zinke has repeatedly expressed his vociferous opposition to wholesale federal land transfers, his enthusiasm for leasing adds up to the same thing. The Interior secretary is running a de facto privatization scheme. Zinke’s zeal is now being tested in northern New Mexico’s San Juan Basin, where, as part of the March auction, the BLM is scheduled to lease 4,434 acres of land that is culturally significant to the Navajo and Pueblo people. The BLM has received 120 formal protests against the sale, including from the All Pueblo Council of Governors — a consortium of 20 tribal nations — four Navajo chapters, the National Trust for Historic Preservation, eight environmental groups, the Pueblo of Acoma and numerous individuals. We have yet to see how the BLM will respond to these official protests, but when it does, we’ll know who really calls the shots and who really owns our nation’s public lands.